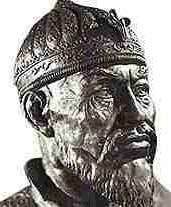 An appearance of Tamerlane the Great. Timur was born on 8 April, 1336 (25 Shahban 736 of Muslim Hijra calendar) in the settlement Khojja Ilgar near Kesh (present-day Shahrisabs in Uzbekistan) into a family of a local nobleman of a Mongol descend. Timur belonged to the Mongol tribe of Barlas, which only in the beginning of the 14th century had settled in Central Asia, intermingling with the Turki population, adopting Islam and gradually giving up its own nomadic ways. Timur was the great-great-grandson of Genghis Khan and conceived the desperate dream of rebuilding his forefather's empire, which was then divided up into a multitude of smaller principalities. (According to Khwandamir, the genealogy Of Timur descends to the Biblical Noah). Locals nicknamed him Timur i Leng, or Timur the Lame, because of a disability, which made him limp. But the world remembers him as Tamerlane the Great. He died in 1405 being a mighty ruler of a half of Asia.